Chances are that you or someone you know has experienced what thousands of others have – a burn injury. Although it is estimated that 80 percent of burn injuries and fire-related deaths are preventable the fact remains that burn injuries continue to remain one of the leading causes of childhood injury and death in the United States. Every year, 250,000 children are injured and more than 1,000 die as a result of burn trauma. Burn injuries can be devastating to adults, children and their families. Unlike other injuries, burn injuries often leave behind emotional and physical scars that can last a lifetime. Those who suffer from severe burns must undergo physical and psychological healing before they can return to a sense of normalcy in their lives. Yet their lives are permanently altered. The Fire & Burn Foundation understands the unique nature of a burn injury and provides burn survivor support programs to help burn survivors cope with the long-term effects of their injuries. My name is Joshua Keeney. I turned fifteen years old on Saturday, November 26, 2016. When I was twelve years old, I was camping with my dad, and accidentally poured gasoline instead of lighter fluid on a campfire. It caused the fire to explode, and I immediately caught on fire. I panicked, and started running, but thankfully someone had the presence of mind to wrap me in a blanket and tackle me to the ground. I was rushed by ambulance to the nearest hospital, and then life-flighted to the nearest burn intensive care unit in Fresno, California. My injuries were so extensive, that I was put into a medically induced coma, and intubated. I sustained full depth, second and third degree burns to approximately 60% of my body, including my face, chest, shoulder, stomach, hands, arms, and shins. I was kept in a coma for about eight weeks, during which time I caught pneumonia, and another infectious disease. The pneumonia was aggressive, and resistant to treatment because I was inactive. They had to use my ventilator to disrupt my breathing, and pound my chest and lungs from the inside, and I ended up on a Rotabed, a crazy, tilted, rotating bed, for a week. During the second infection, my fever reached dangerous levels, and I was placed on a special ice bed. They also began full depth skin grafts while I was in a coma, which is a process where they took donor skin from my back, thighs, calves, stomach, and scalp, placed it on a stretching machine, and applied it to the burned areas to cover the burned skin. In between surgeries, I was wrapped from head to feet in bandages. When my lungs were finally strong enough to breathe on my own, they allowed me to wake up, but I was heavily medicated on hallucinogenic drugs like ketamine, to help manage the pain. I was unable to eat or drink for several more weeks, and was fed through an NG tube in my nose, and an IV line. Even so, it was important not to let my muscles continue to atrophy, so each day, the Physical Therapist and her assistant came in to make me stand, and eventually walk again. I can’t describe the pain of having to move not only sore, severely atrophied muscles, but also the skin, that was so tight. Just sitting up was exhausting and painful, but I still had to scoot, painstakingly and painfully to the edge of the bed, and somehow stand up. Eventually I had to start walking again, and I screamed and cried in pain. There are no words to describe the agony. At this point, I was having skin grafting surgeries every other day, and bandage changes each day in between. Before I even left this first hospital, I had a total of nine, eight-hour surgeries, and at least 30 bandage changes. Once I was discharged from this hospital, I was transferred to UC Irvine Medical Center, for another week for medicated bandage changes, which my parents did, and then I spent two more weeks at Healthbridge for inpatient, intensive Physical, Occupational, and Speech therapy. I had to work on balance, walking up and down stairs, grasping and holding things with my hands and fingers, stretching my mouth, and learning how to speak clearly. Once I was discharged from this hospital, I continued outpatient Physical, Occupational, and Speech therapy three days a week, one hour per session, for the next eighteen months. On the days we did not have therapy at Loma Linda, I did therapy at home, 2-3 times a day. We also drove an hour into Orange County every other week for the next year, for Burn and Wound Care, and to meet with the Plastic Surgeon. Even with all that therapy, it was still not enough to keep my skin stretched out in some places. My chin pulled tightly to my chest, and I was unable to look up without moving my whole upper body. It also pulled the skin of my eyes down. My lip fused to my chin, my thumb fused to my pointer finger, and I have extensive webbing between my fingers. I also had extensive, hypertrophic scarring everywhere I had skin grafts. Hypertrophic scarring is where the skin builds on itself, so I have thick, raised scars. I have had four more full depth skin grafts to my lip, neck, and thumb, and three z-plasty surgeries to my lip, neck and thumb. Additionally, I have had laser surgery every other month to correct the hypertrophic scarring. To date, I have had ten laser surgeries, and will continue to have them every other month to my face, hands, arms, shoulders, back, neck, and chest, at least until I turn eighteen. I will also have at least two more z-plasty surgeries to correct my ears, and the webbing on my hands. So far, I have had twenty-six surgeries, not including the bandage changes, and probably have a minimum of twenty more surgeries coming up over the course of the next three years. One of the hardest things to deal with has been getting used to how I look since my accident. I was terrified that no one, not even my mom, could love me anymore. Of course my mom still loves me, and always tells me how handsome I am. But I have had to learn to deal with people staring, and with cruel comments. I have had people tell me I look like Freddy Krueger, and had one person even tell me I should’ve just died in the fire. Other than the pain of the surgeries and physical therapy, cruelty has been the hardest challenge to overcome. This is why I love camp. I had never been to camp before my accident, so I had no idea what to expect. The reality of camp exceeded all my expectations. I have many friends in my neighborhood, and at school, but none of them can ever understand what I have been through. They will never have to deal with bullies in the same way I do, or have the kind of scars that change how you look and feel about yourself. I even have a vocabulary that only other burn survivors understand. This brings me to the best thing about camp. Camp is a place for survivor kids to be together. It is a place for us to have fun, and be around other kids who understand and support each other. No one stares at camp, because we all have scars, and no one bullies us. Camp teaches us we have value beyond our appearance, and gives us a game plan to deal with staring and bullying. At camp, I look forward to being around kids who are like me, and doing amazing things like zip lining, and snowboarding. I really look forward to our banquet, where we dress up, dance, and get to have a photo booth. These experiences are what make all the challenges that burn survivors go through a more positive experience. Because of my experience at camp, I am stronger as a person, and more confident in myself. I am so grateful to the kind and generous people who make camp possible for survivors. You can help Josh, and children like him, by donating to our camp program. 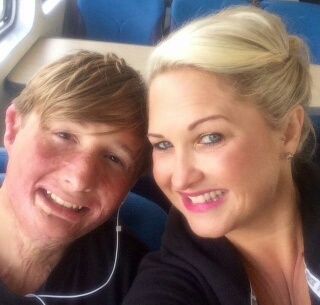 The Fire & Burn Foundation is pleased to support Burn Survivors on their road to recovery. Limited funding is available for assistance with expenses related to burn survivor support services offered outside of our service region of Riverside and San Bernardino Counties. These include Youth or Adult Retreats, Family Camps, Day Trips, Burn Conferences, etc. Every effort will be made to fund requests but is not guaranteed. Must complete, in full, and return the Burn Survivor Sponsorship Application to the Fire & Burn Foundation at PO Box 1423, Colton, CA 92324 or by fax to 866-628-8047. Submissions must be received 60 days prior to the event/activity start date (some exceptions may apply). Thank you for your interest in our camp program. Embers of Hope camp has been rescheduled to July 26-29, 2019 in Angeles Oaks, CA. Please complete and return your application before the deadline June 15, 2019. If for any reason, you must withdraw your application, please notify the Fire & Burn Foundation in a timely manner. Each year we receive more and more camp volunteer applications. Unfortunately, we only have a limited number of spots for counselors and simply cannot accommodate everyone. For this reason, we advise sending in your camp application as soon as possible. All applicants, whether selected or not, will be notified by mail after June 15, 2019. NOTE: There is no guarantee that a prior volunteer will be selected to participate in this camp session. If you are a new counselor/applicant you will be required to attend a short interview in (TBD) and must commit to Mandatory Counselor Training in order for your application to be considered. A Mandatory Camp Orientation Training will be held in (TBD) at Arrowhead Regional Medical Center, Oak Room. A Meet & Greet will immediately follow with the campers and their families. If you cannot attend either of these dates please notify the Foundation as soon as possible so we can make alternate arrangements. All applicants will be required to remain at camp for the entire duration of camp. Please contact us immediately if there is a conflict and the camp committee will consider the impact to the camp and campers, and a decision regarding your attendance will be made. Negative action by applicant that in any way lessens the camp experience for campers, volunteers and staff alike. This applies to any previous camp session, as well as, before or during the 2019 camp session. You may either complete the online application below, or download, print and fill out the appropriate application and submit it to the Fire & Burn Foundation. If completing the online application new counselors will need to complete the entire form. Returning counselors are only required to complete the "required" fields, which are indicated by a red asterisk. Please contact the office for a paper application.